Lavender is an evergreen woody shrub (classed as an herb) which grows to about 1 metre in height; it has grey-green narrow linear leaves and beautiful purple-blue flowers, perched on a long stem. Lavender can be found growing in many parts of the world; it is also grown on a commercial scale to produce the essential oil, which is extracted from the flower spikes, buds and leaves via steam distillation. Lavender essential oil has a fresh, sweet and floral aroma with woody undertones, it has thin consistency, and is clear with a tinge of yellow in colour. Lavender essential oil is a vital part of your natural first aid kit, and is a handy oil to have around the house. It has a wide variety of uses, and when diluted properly, is one of the safest essential oils to use. It has anti-bacterial, anti-septic and anti-inflammatory properties making it ideal for use on minor cuts, scrapes or burns, and is considered safe enough to use on children. But lavender essential oil doesn’t just have a positive physical effect; it also affects the emotional state to. It has the ability to help calm stress and anxiety; it also has sedative properties and can be used to help promote a restful night’s sleep (if used in excess however, lavender essential oil can actually act as a stimulant). On the skin it helps to tone and revitalise and is used to help acne, oily skin, sunburn, psoriasis, insect bites and stings. Lavender essential oil is a very versatile oil, and blends particularly well with cedarwood, clary sage, geranium, pine, nutmeg and all citrus essential oils. It can be used in burners and vaporisers to ease insomnia, to help with stress, anxiety, headaches, allergies and to act as an insect repellent. It also has a calming effect on your surroundings helping to put your mind at ease and allowing you to unwind. In a bath or massage oil it can aid insomnia, ease stress and anxiety, or you may just want to enjoy the pleasure of relaxing in such fragrant surroundings. In a cream or lotion it is helpful by healing skin faster and with less scarring. It has a balancing effect on the skin, and when used as an anti-inflammatory it can help skin conditions such as eczema, psoriasis and acne. It is also capable of easing the pain of sunburn and the itching associated with insect bites and stings. 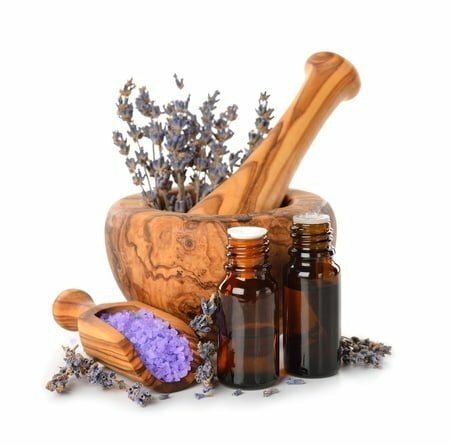 Chemical constituents of lavender essential oil: Borneol, Geraniol, Lavandulol, linalool, Geranyl acetate, Lavendulyl acetate, Linalyl acetate, Cineole, Caryophyllene, Limonene and Pinene. Properties of lavender essential oil: Analgesic, Anticonvulsive, Antidepressant, Antiphlogistic, Antirheumatic, Antiseptic, Antispasmodic, Antiviral, Bacteriacide, Carminative, Cholagogue, Cicatrisant, Cordial, Cytophylactic, Decongestant, Deodorant, Detoxicant, Diuretic, Emmenagogue, Fungicide, Hypotensive, Nervine, Restorative, Sedative, Splenetic, Sudorific and Vulnerary. Why do we use Lavender essential oil: We use Lavender essential oil in a number of our products for its healing effect, skin regeneration properties and the balancing effect it has on sebum. It also has sedative and calming properties, which can give effective relief to those suffering from insomnia and bring a calmer approach to life. Where do we use Lavender essential oil: Lavender essential oil is used in our Goats Milk Honey Lavender Soap, Natural Handmade Lavender and Blue Poppy Soap, Natural Handmade Patchouli and Lavender Soap, Natural Handmade Aniseed and Red Clay Soap, Meadowcroft Soap, Patchouli and Lavender Bath Soak and of course our 100% pure Lavender Essential Oil. Although lavender oil is considered one of the safest essential oils, you should discontinue use, as with any essential oil, if you have any allergic reactions.